We got our first ever puppy, Cooper and had no idea where to start with food. My husband and I were overwhelmed with the choices and ingredients and didn’t know the first thing about choosing dog food. With the help of the staff from Four Paws, we were guided through the pros and cons of each of the brands and given great recommendations for a food that would make our yellow lab happy. We started with Acana and Cooper is doing great! He runs to the bowl at each feeding and is so healthy. Cooper has a soft and shiny coat, plenty of energy and is really happy. 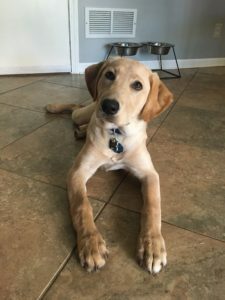 We plan to continue to work with the helpful Four Paws staff as he grows up about his nutrition and food because they really know what they’re doing!